Ansonia and Royal Bonn "La Hay" Mantel Clock, c.1895 Case- The Royal Bonn Co., Germany; the movement (works) by the Ansonia Clock Co., New York; the porcelain case with floral abundance-Royal Blue accents with white background behind the flowers and gold highlighting on edges. Flowers on each side of the case also. Brass movement; fancy brass dial center and bezel. Paper numeral ring; 11 inches tall by 8" wide; Condition: Very clean and beautiful clock; in good running condition. Additional Dealer Comments: Royal Bonn collectors often seem to demand only those clocks with an outside escapement-meaning that there is a little toothed wheel under the numeral 12 which rotates as the clock operates. This seems to fascinate and charm certain types of individuals. Others prefer the shape of the clock case and still others the coloring. 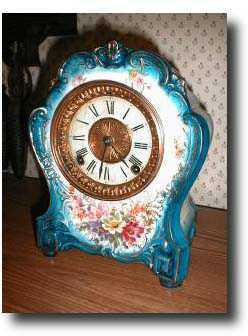 This beauty-marked the \'LA HAY\' by the Royal Bonn Co. (on the back of the clock case) is as colorful and attractive as any we\'ve seen. It is clean and without any chips or gouges. There IS however, a tiny hair line on the back of the case below the Royal Bonn trademark. It is stable and will undoubtedly never cause any further problems-but it IS there and we want prospective buyers to know about it up front to spare them (and us) the distress of "discovering" something not disclosed ahead of time.